This ViA comes with a gempod filled with amethyst - chalcedony - petrified wood - rose quartz - ocean chalcedony. VitaJuwel ViA is GEMWATER-TO-GO, the portable solution to enjoy VitaJuwel gemwater wherever and whenever you like. ViA is a glass bottle with two openings. 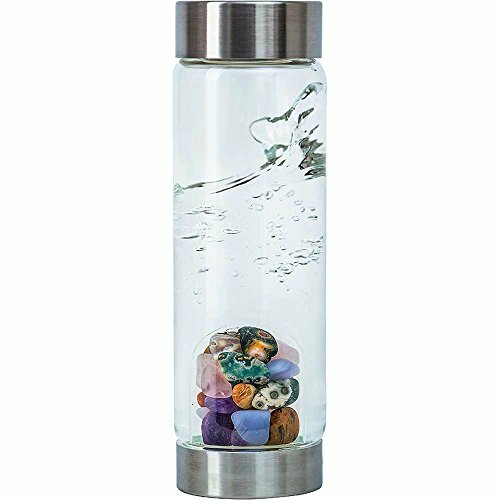 It's made of high quality, premium glass and comes with an exchangeable bottom piece ("gempod"), filled with a selection of hand-picked gemstones. The patented gempod is manufactured by hand in the Austrian Alps. gempod filled with amethyst - chalcedony - petrified wood - rose quartz - ocean chalcedony. If you have any questions about this product by VitaJuwel Gemwater Bottle, contact us by completing and submitting the form below. If you are looking for a specif part number, please include it with your message.